For those who do not live in a true winter climate, the allure of the snow day won’t make much sense. For those who do however, and who have children, you’ll recognize this story immediately. The ever elusive Snow Day is to the school goer a version of Monopoly’s ‘Get Out of Jail Free’ card on steroids. A legitimate chance to miss a day of classes and license to goof off mid-week. Moms love them too. Historically we would have a snow day or two a year in our area. Then four years ago we got a new Superintendent of schools, supposedly from Montana, and supposedly pledging to parents upon his election that the coveted snow day would not interrupt the school year (which had apparently been a criticism of his predecessor). All these facts have been reported and amplified over the last few years by school kids, I suspect trying to find the rhyme and reason for no snow days. Elementary school kids have cultivated rituals they firmly believe will coax a snow day out of even our Montana Superintendent. We often know if is going to snow before it does from a malodorous stench of feed lots in the air. I was told after moving to Boulder if you smell this, it’s going to snow. And it did. This has to do with the wind patterns blowing down from the north. This generally kicks the kids into high gear to direct all their weather mojo toward manifesting a snow day. It’s a four-part ritual including wearing pajamas inside out, sleeping with a spoon under your pillow, throwing toilet paper out your window and flushing ice down the toilet. As an observer of this primitive ritual I would say the success of the outcome is usually low if existent at all. Last week there was no feed lot odor, no inside out pajamas and no realization a big storm was going to hit in the middle of the night, not leaving enough time for street crews to clean up before the morning rush. Eight inches of snow and the first snow day was called in the last four years. For my children, who were in the middle of Finals (especially my high schooler who’d been up until after midnight the night prior) it was the first snow day that wasn’t greeted with joy and unbridled enthusiasm. While they were hanging on the internet waiting to understand the new Finals schedule to see what they’d study on their day off, I was consumed by the idea of making fudge. I don’t know why exactly but it was the first thing on my mind when learning we’d have the day off. Snow days are the mother of invention. We are usually stuck inside and have to use what is on hand to eat and entertain ourselves. 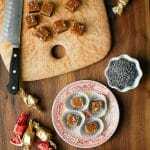 I love the challenge of making food with what I have on hand and fortunately with a stash of chocolate for baking projects in my freezer and a relatively well-stocked pantry it’s wasn’t a huge stretch. 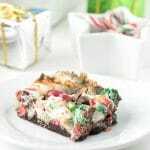 It did seem a perfect opportunity to create a holiday themed version of traditional fudge, thanks to this day which closed the gap on winter break by a smidge. I should note I’m not a frequent fudge-maker. I have probably made it a handful of times in my life. It’s very easy and flexible to be changed up depending on how the mood suits. 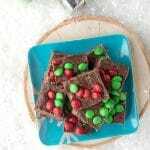 In the past I’ve made it with sweetened condensed milk however only had evaporated milk on hand but was able to adapt to create a creamy chocolate fudge with toffee bits and festive M&M’s on top. Quick to make, it was an unexpected treat by early afternoon that was appreciated by all. And though it was a fun excuse for me, there really is no snow day required to make this! 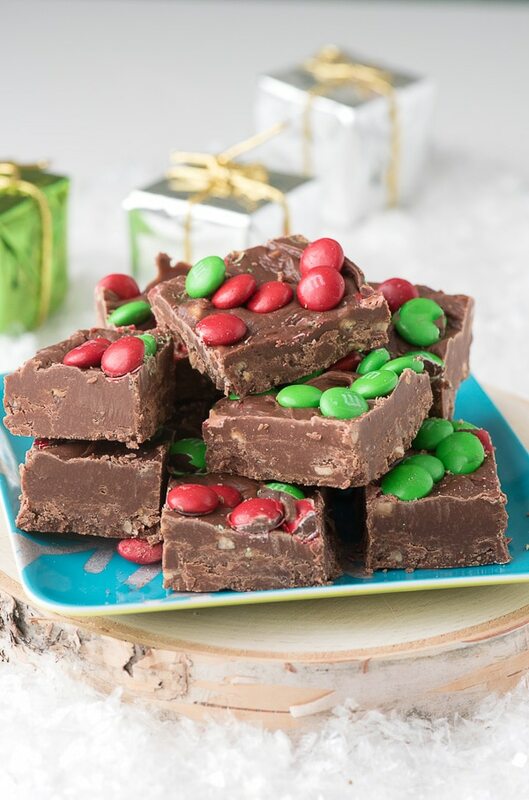 This creamy chocolate fudge recipe is made even better with toffee bits and M&M's on the top. Whipped up in about 15 minutes active time, it chills for 2 hours and is ready to eat! Line an 8 by 8-inch square pan with foil. In a medium mixing bowl combine the marshmallows, chocolate chips and vanilla; mix together. Measure out (separately) the toffee bits and the M&M’s and have them ready to incorporate when needed. In a large, heavy-duty sauce pan combine the sugar, evaporated milk, butter and salt over medium-high heat. Bring to a full rolling boil, stirring constantly, for 3 ½ minutes. Remove from heat and immediately add the marshmallow-chocolate mixture, stirring vigorously until the chocolate and marshmallows have melted creating a creamy mixture. Stir in the toffee bits and pour or spoon the mixture into the prepared pan, smoothing it to fill the pan evenly. Sprinkle the top with the M&M’s and refrigerate until solid, about 2 hours. Lift the foil with the fudge from the pan and cut into squares. What a fun thing to do on a snow day. YUM YUM YUM YUM YUMMERS!!! We LOVE snow days around here, but we haven’t had any this year so far. We haven’t even had a delay. Like you, we tend to make yummy recipes and have fun! I’ll have to keep your fudge recipe in mind. It looks terrific! What a fun holiday treat! I would love to make this for my family! LOL Those rituals are funny. I have never heard of anything like them. Between us girls, probably a good thing. I think their success rate is zero percent to date! You definitely made the most of the unexpected snow day. Yum! Here in Carolina, the adults get as excited as the kids! Merry Christmas Toni! Merry Christmas Chris! Hope you’ll be enjoying the whole family and some wintery weather. One of my favorite parts of the holiday is baking with my sisters! Gotta add this to the menu! I love to make fudge. 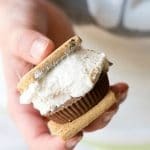 This looks like a delicious and easy recipe to make. I will have to try it this weekend. That looks like such a delicious treat! I should bring some to work! We are also fans of the snow day. My husband would love to get a day where the factory shut down due to snowy conditions! 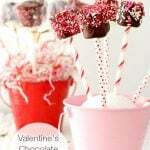 I love chocolate and your recipe looks well laid-out and easy to follow ….and looks delicious! Well this sound delicious and it looks super festive. I’d love to have some fudge like this for the guests. The toffee bits sound wonderful in fudge! Happy snow day and I hope you have a very Merry Christmas! You had me at chocolate fudge. Love the holiday M&M’s as well. 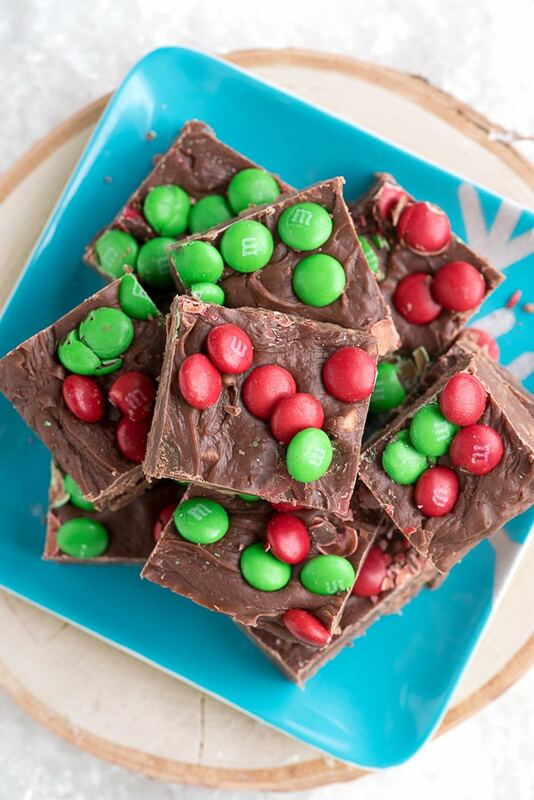 M&M topped fudge? Yes, please! That sounds like a winner to me. I’ll have to make this immediately. That fudge is the bomb diggity! 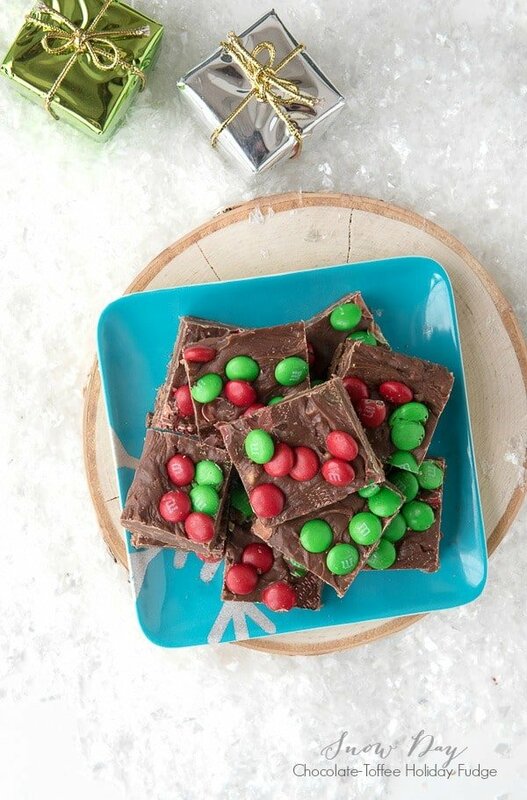 I seriously love anything with M&Ms on top, and fudge is ALWAYS a winner. That sounds so good. I am a major fudge fanatic, so I definitely need to try this 🙂 NOM!